For many of us, music made right here in Saskatchewan was our soundtrack in 2018. These were the songs that helped us celebrate the highs, guide us through the lows, and serenade us through everything four seasons in the Canadian Prairies delivers. The all-female alt-rock trio The Wolfe have released their second EP Strange Words this year. The album was recorded in Saskatchewan by Red Door Recording’s Ryan Andersen; co-produced by Lucy James. 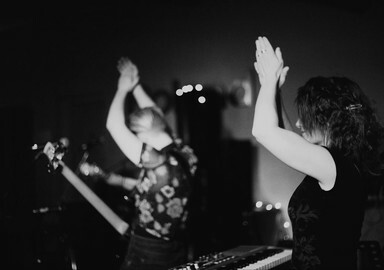 Siobhan Bayda (vocals/bass), Gabrielle Giroux (guitar/vocals), Tesa Thompson (drums) started making music together in 2012, and in that time they’ve released a successful debut EP The Wolfe, played a few major Canadian festivals, and scored a spot as a Top 4 finalist for CBC Searchlight in 2017. “Tip of My Tongue” is the first track off the EP and was chosen to be the first radio single- rightfully so. The chorus is a nice balance of catchy pop energy with that rock and roll edge. “Bouquet” is smart, lyrically passionate. “You’re so Boring” has a killer guitar line and sassy lyrics. The only slow-tempo track comes from “The Artist” which comes as a duet, featuring Rylan Schultz from the alt/indie band The Pistolwhips. The song’s glossy sound and the blend of their voices makes for a delightfully moody ballad. The 5-track EP ends with the second radio single “Pig & The Hound” which feels like a love child between Metric & The Pretty Reckless. 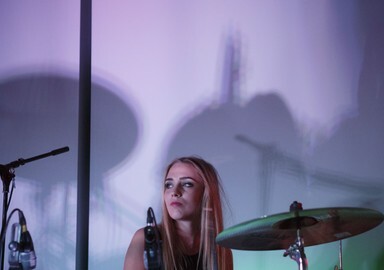 From Debbie Peterson of The Bangles to Meg White of the White Stripes, there remains a niche club of women behind the drums who have paved a path for its future members. Tesa Thompson is a member of that club. And, it’s something she’s wanted for a long time. She’s still in disbelief of her band’s inclusion in the final incarnation of the legendary Warped Tour in Toronto. Their rock ‘n’ roll dream became a reality when they were booked on the tour’s last Canadian date. 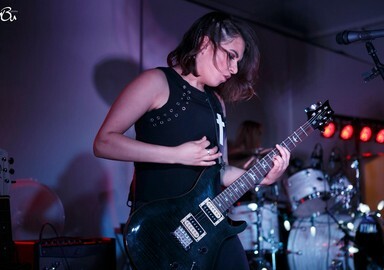 Her and bandmates, singer Siobhan Bayda and guitarist Gabrielle Giroux, told themselves seven years ago that playing Warped would be the high point of their journey. If they made it to this stage, nothing would stop them from being in this business. It’s an iconic moment that is forever engraved on their music resume. 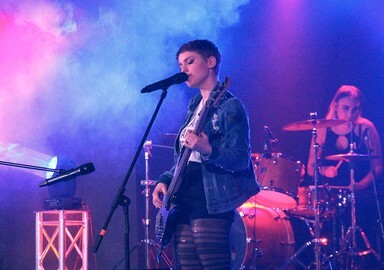 Tesa Thompson, 19, is one-third of the alternative rock band, The Wolfe. The Prince Albert, Sask. band broke into the spotlight as finalists on CBC Music’s Searchlight competition in 2017 and have since released and toured their second EP, Strange Words. 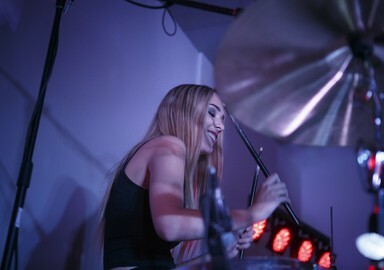 She’s wanted to be a drummer since she was 11-years-old and even proclaimed this to her father during a drive down a long road. Truth be told, he thought it was a phase. But, there is nothing else she’d rather be doing. 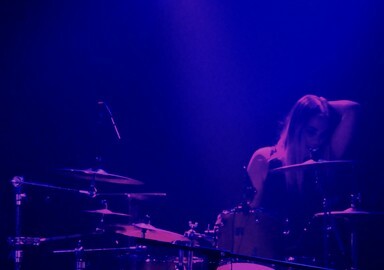 Throughout her seven years in the music scene, seeing other female drummers on stage is something Thompson takes much pride in seeing. 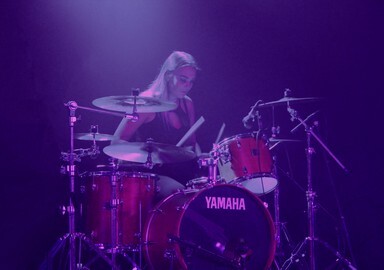 But while her reception as a female drummer has been positive, comments such as “she plays well for a girl,” continues to brand female drummers. There hasn’t been a struggle to be taken seriously, except for the rare occasion. Being part of the generation that is shaping the future climate of the industry, traditional gender barriers are being re-evaluated, dated and broken. 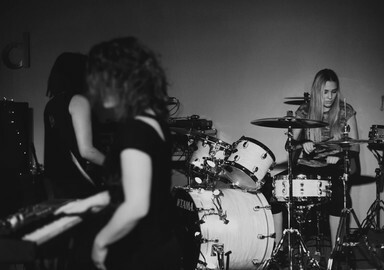 We have platforms like Tom Tom Magazine who feature female percussionists from all over the world and work to eliminate the tokenism of female drummers in the industry. Thompson is tired of people referring to gender before acknowledging skill. 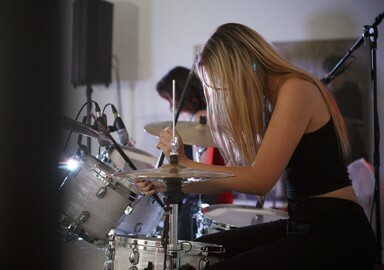 With the right skills, and the encouragement to develop and showcase those skills, “confidence skyrockets when (women) discover that they can do anything they want.” She says that being a drummer is not a tough career choice for a woman -- passion and dedication to your craft transcends gender barriers. Indie Week 2018 kicked off on Tuesday night with dual shows at Toronto’s Revival. With more than 200 bands in the city to play over six nights, the combo of the upstairs/downstairs showcases and the official launch party was a great way to get the festival started. In just a few short hours we had the chance to see two of our 10 Don’t Miss Bands at Indie Week 2018, the 2017 winners of Best Of The Fest, and more. We started our night of music upstairs with The Wolfe. 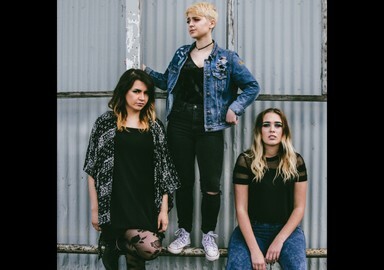 This trio of badass rock and roll women from Prince Albert, Saskatchewan have already started making a name for themselves in music circles, finishing as a Top 4 finalist in the 2017 CBC Searchlight contest. And on Tuesday night Siobhan, Gabrielle, and Tesa gave Toronto a quick taste of what they’ve got to offer. When life becomes chaotic, sometimes the best thing you can do is embrace the snarl. Turn up the music, let it fill you from toes to top, and close your eyes. This is how I felt the first time I listened to The Wolfe’s Strange Words. The power is invigorating; the lingering chords are a constant. There is a bittersweet interiority to the songwriting that keeps it tethered to reality, though barely. This is a record that is heavy and lofty at once — delayed guitars giving bounce to a world of lingering vocals and desire. 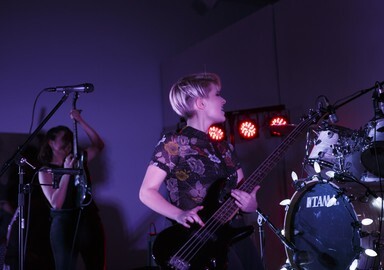 Having drawn comparisons to Metric and U2, The Wolfe perch on the edge of punk aesthetic, but this Saskatchewan band paints with strong and firm strokes. The first track on the EP, “Tip Of My Tongue”, opens with a deeply delayed guitar riff that drives the nightlife ambiance of the track. From there everything grows as the bass thrums and the vocals swing. It’s a highlight right off the bat and uses rawness to bring a sense of satisfying unravelling. The duet with RYLAN that occurs on “The Artist” is another highlight and is perfectly placed on the record. This slowed down meandering is sweeter and more mellow, though no less dark. It’s a slow haunting moving at the speed of romance, and it opens the album for a big conclusion: the melodic and hefty “Pig & The Hound”. 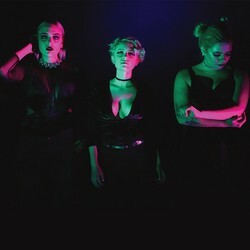 Saskatchewan all-female trio, The Wolfe, dropped their new single “Tip of my Tongue” today. It is the first single since their debut self-titled EP. It is also the first single off of their new album, to be released this spring. 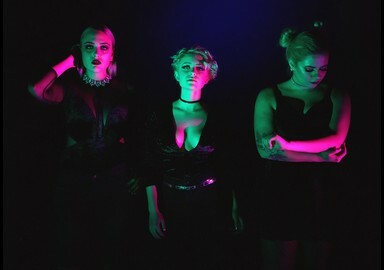 Prince Albert’s all-female musical troupe The Wolfe are gearing up to release their latest work after months inside the studio. The alt-rock outfit will tease their new single Tip Of My Tongue from their upcoming second EP tonight at the Rock and Iron Sports Bar. They will be joined by local bands The Brownies and Between Bridges. Lead vocalist Siobhan Bayda said the band's new record will have a more matured, focused sound. The new album will come on the back of a blockbuster year for the band. In April, The Wolfe had a top-four finish in CBC Searchlight national music competition before they hit the road touring across Western Canada this past summer. The trio also clinched the Toronto Independent Music Award's 'Best out of Province’ award this fall. Graduating high school in June has freed the teen's schedule to dedicate as many hours in a day as needed to hone their craft. But of course, the life of a musician is not all sunshine and rainbows. Each said they questioned their choices this fall when all their friends departed to colleges in other cities, got jobs or married, and they were still here. Drummer Tesa Thompson echoed this, saying transitioning from the enhanced exposure in the Searchlight competition and touring took some time. This, however, has been a positive learning experience for the teens, and one they will use to grow and build upon. While they could not share any big plans they have in store for the future, they told their fans to stay tuned for some exciting news. BreakOut West 2017 takes place in Edmonton, AB between September 13 – 17. The event encompasses the Western Canadian Music Awards, Industry Awards, Hall of Fame Induction, Industry Conference, Kick-off Concert and a city-wide Music Festival. It’s the place to be if you’re able! The Festival itself features over 60 of the best in Western Canadian bands and artists, and we are happy to chat with a few of them leading up to the event! For our first interview, we spoke with Manitoba based Kayla Luky, then Vancouver’s The Matinée. Today, the fun continues as we chat with Saskatchewan’s own, The Wolfe. First off, care to introduce yourself to our readers? 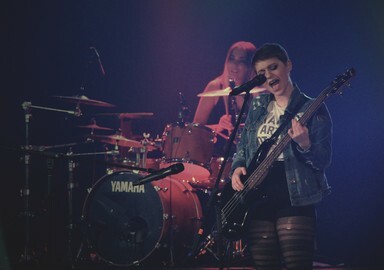 We are The Wolfe, an all-girl alternative rock trio from Prince Albert, Saskatchewan. You are taking part in this year’s BreakOut West, what does it feel like to be a part of this event? It’s such an honour to be representing the best up and coming artists in Western Canada, not to mention playing beside some of our favourite local bands. What other bands/ artists are you looking forward to checking out at BreakOut West? Definitely our Sask friends in Ponteix and Poor Nameless Boy, but also some of our favourite Canadian bands, Scenic Route to Alaska, and The Tourist Company. Besides the performances, is there any other event that you’re looking forward to? We’re looking forward to the Award Reception, as we’ve never attended something like that. But the whole conference as a whole is going to be fun, and the people we will meet will top everything off. I hear there is a Closing BBQ on September 17, so of course, I have to ask, what’s your go to food to BBQ? Definitely pulled pork if there is any. Do you have any other upcoming shows that you’d like to tell us about? No upcoming shows yet, but we have new music coming out shortly, which will lead to show announcements as well! If someone has yet to see you perform live, how would you describe your live show? It’s a high-energy show, with a lot of glitter. Be prepared to move and groove. If you were only able to recommend ONE song for a new listener, which would you choose? Here at Canadian Beats, we’re all about Canadian music, who are some of your favourite Canadian bands/ artists? You watched, you voted and now, it's time to get to know the Searchlight 2017 final four. Leading up to the April 9 finale broadcast on CBC-TV, we'll help you get acquainted with each of the artists vying for the title of Canada's best new music act. Below, get to know Prince Albert, Saskatchewan's the Wolfe. Tell us a little bit about your song. "Dumb Dog" is a song that we find to be very universal. Although it was written with a specific intention, it has been interpreted in different ways by different people. "Dumb Dog" was inspired after our struggle with being seen as a gimmick because we are women in the music scene. Sometimes, we can be taken as a joke or not as seriously as should be expected. "Dumb Dog" is our feminist anthem, but speaks to more than women. It’s about staying true to yourself, and not changing for someone else. You’re perfect the way you are and you should embrace that. This song was written by Siobhan on her couch after a hard day. She brought the idea forward on her ukulele to the rest of the band, and soon after, the song flourished into the catchy tune we know today. True music comes from honesty. What inspires us to write music is our lives, as cliché as it sounds. It’s the worst moments in life, and it’s the best moments in life. It’s everything in between and the things that are overlooked that inspire us. This is the reason our music speaks to a variety of people. We don’t write what we think others want to hear; we write what we need to express and let out. We write music so that we are heard. Even though we’re all in a band together, our musical idols differ greatly. All of our roots started in a different place, from classic rock and pop, to metal and folk. We draw inspiration as diverse as Twenty One Pilots, Radiohead, Weezer, Evanescence, Paramore, the Naked and Famous, and Nirvana. Our musical idols that inspired us to start a band would have to be Marianas Trench, Fake Shark, AC/DC and My Chemical Romance. People like Hayley Williams, Amy Lee, Joan Jett, Blondie and Madonna are all female figures in the music scene we look up to. If you were to describe your sound to somebody in one sentence, what would that sentence be? Risk-taking, sometimes cheeky, yet stuck-in-your-head catchy tunes by three girls who you can relate to. What is your favourite thing about playing music? Our favourite thing about playing music is that feeling you get when everything just meshes together, and works so well, that your heart melts, you get butterflies, and you just feel the emotion. It’s not something that’s easy to describe, but rather something you have to experience, and we get to by playing our music. If you could play a show with anybody, who would you pick? It would be really sick to play an all-girl power tour! But honestly, a show with Paramore, or Twenty One Pilots, or Marianas Trench … how can you really pick? What’s your favourite musical memory so far? This Sunday (April 9, 2017) at 6:00pm, the CBC Searchlight Top 4 will be narrowed down to one winner! The four remaining acts will perform in front of a studio audience and be critiqued by three celebrity judges — Ruth B., Dan Kanter, and Jarvis Church — who will then crown the 2017 winner! One of the acts performing this weekend is a band from Prince Albert, Saskatchewan named ‘The Wolfe’! This group of talented 17-year-old girls are the youngest of the Top 4! 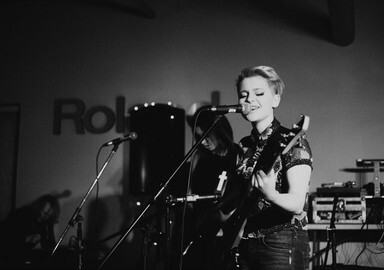 The band has often been compared to groups such as Metric and The Cranberries, while also possessing a sound that is reminiscent of Paramore and Evanescence. Their self-titled debut EP showcases their wide range of mature songwriting talent and diversity as a band. Something truly unique about the songwriting style of The Wolfe is that they begin every song by first outlining the lyrics. Giroux explains that the song’s message is the basis of every creation. The band then lets the lyrics mold the song’s chords, melody, and overall vibe. It’s refreshing to see such young artists taking a strong initiative to implement a conscious message in all of their songs. Prince Albert musical troupe The Wolfe is putting the final touches on their plans to hit the road for a tour across Western Canada this summer. Coming off the back of a top four finish in CBC Searchlight national music competition in April, the trio is eager to take their music to cities across the prairies and west of the Rockies. “It is overwhelming but it will be so fun once we are on the road,” band member Gabrielle Giroux said. This sentiment was echoed by fellow members Tesa Thompson and Siobhan Bayda. Despite the enhanced exposure through the Searchlight completion, the girls said they looked forward to the trek across the West. This will be one of the first times the teens will be away from home for an extended period of time. While they laughed saying “the parents are terrified," the group said their families have been very supportive. Thompson’s parents have donated a tour van for the trip. Before they hit the road, The Wolfe will make an appearance in Ottawa on July 2 for the CBC Searchlight live show. They were eager to take the stage and experience the capital for the Canada 150 celebrations. The girls said they are simply working to get their music to as many ears as possible, expand beyond Saskatchewan and open new doors. Prince Albert’s alt-rock trio The Wolfe are out with new music from their upcoming second EP Strange Words. 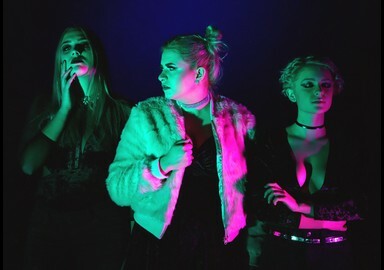 Titled Pig & The Hound, the new single is darker and grittier in contrast to the more pop-style pieces of the past, and according to the all-female group, a product of growth in their musical careers. The song is centred around anger from a past relationship, moving on and wishing someone the best. In the songs music video, dark hues of red, purple and black help accompany the feeling of angst and resentment. “For our old music, none of us were in relationships. 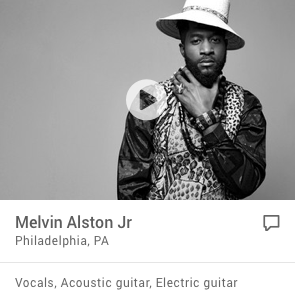 So we are finally diving into that chapter of the music world,” guitarist Gabrielle Giroux added. The Wolfe teased their first single, Tip Of My Tongue, from the EP earlier this year. At the time, they said the new record promises to have a more mature, focused sound. The album will come on the back of a blockbuster year for the band. In April, The Wolfe had a top-four finish in CBC Searchlight national music competition before they hit the road touring across Western Canada this past summer. The trio also clinched the Toronto Independent Music Award's 'Best out of Province’ award last fall. As with their self-titled debut album, the troupe plan to embark on a Canada wide tour, with arrangements to take the stage in Toronto. Preparing for this, alongside the single releases and soon-to-come EP, the girls said, has become a full-time job. And too all this, the band said the support of Prince Albert has been overwhelming. “It is incredible that they came to see us when we were 13 paying our first shows and they still come back,” Giroux said. Saskatchewan’s The Wolfe released their debut self-titled EP back in June. Its 5 tracks are filled with ukulele-driven, alt-rock inspired electronic beat. By listening to The Wolfe, you would never guess they are only at the age of 16. Siobhan Bayda’s vocals are strong and soft. The music complements her voice in a way that strengthens the sound and turns each song to a powerful ballad. Some of my favourite songs are “Dumb Dog” and “Need You”. The vocals and ukulele give off that indie vibe while backed by drums and guitar/bass that sets its roots in alt-rock. 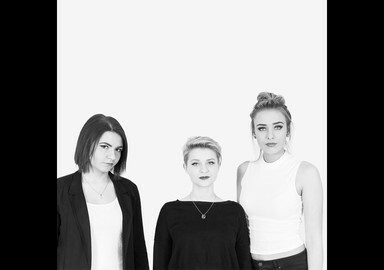 A trio of young, talented girls from Prince Albert are about release their debut album. This Saturday, Gabrielle Giroux, Tesa Thompson and Siobhan Bayda, known as The Wolfe, are hosting a release party for their debut EP. The event will take place at the Mann Art Gallery with the doors opening at 7 p.m. and a show to follow at 7:30 p.m. Admission is $10. The girls, all 17 years old, said the album has been a work in progress since becoming a group at the age of 13. Giroux said they started writing their own songs two years ago and an EP release has always been their goal. “We’ve all grown up with this band. The things we're going through... are starting to be more relatable to older audiences, not just the young,” Giroux said. Not only has their sound matured over the last few years, but their playing has too as they explore new musical genres. Bayda said all of their songs have different sounds as they explore different techniques. Their song Dumb Dog has a more soft pop, folk music style that’s accompanied by a ukulele, Can You Hear Me? is more of a rock song, Need You is a pop ballad along with Arm Yourself. When the girls first began the band they were influenced by Evanescence. After Thompson and Giroux heard Bayda sing an a cappella version of Bring Me to Life the two knew she had to join as the group's lead singer. “As I grew up as a teenager my musical influences changed,” Bayda said. “Everything that we’ve heard as individuals growing up, before writing music, kind of came together. We all like rock so let’s write and whatever comes out of it, comes out of it,” Thompson said. All three said their experience recording the EP was such a learning process but they went with the flow and learned along the way. “It’s a lot of work,” Giroux said. Each had to learn to play with a metronome and to play individually in the recording booths without the influence of other band mates. “When I had to go in a small tiny sound proof room to record vocals with no one else around me and just listening to a recording was the strangest experience ever, but I liked it, you hear your voice so clearly. It was cool,” Bayda said. Giroux found the hardest part was going through highschool, studying for midterms and balancing being a teenager. “It does take a lot of hours that people might not realize. We were sitting in the studio doing homework as Siobhan was doing vocals. It was a tough balance, but we managed it,” Giroux said. At the release party the audience will even get a chance to hear some music that didn’t make it onto the EP. “You never really stop writing; there’s always new songs, new ideas coming up. We’re hoping in the next year to get a full length 12-track album done. In the near future we’ll be touring, promoting this EP, getting the sound out there and our name out there,” Giroux said. A trio of young friends decided in French class a few years ago that they wanted to form a musical band together. The only catch was that none of the Rivier Academy students knew how to play any instruments. “So, it was kind of a learning process from the beginning,” Tesa Thompson recalled. 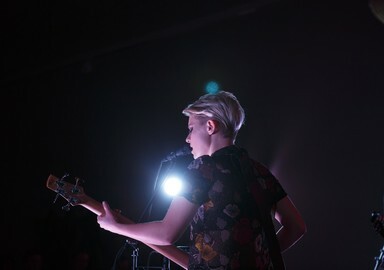 Thompson was keen on the drums, Gabrielle Giroux was enlisted to play guitars and sing backing vocals, while Siobhan Bayda took on bass and lead vocals. Local music teacher Lucy James of Jam Street Music Sessions -- “she’s like the mother of the band,” said Thompson -- helped the trio learn their instruments and find their sound over the course of a few years. On Sunday, the musicians performed at Little Red River Park for the Pine Needle Mountain Bike and Music Festival. 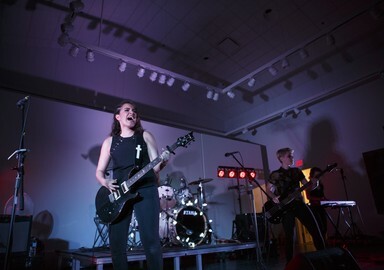 Performing an eclectic blend of folk music and hard rock, the three remained energetic throughout their set, making their love for music clear to anyone watching. Between keyboard players at the moment, James joined The Wolfe for Sunday’s set. During Sunday’s performance, they announced an upcoming EP release party for June 5 (see breakout box for details) -- their first album. It’s been a long journey to get to this point, the band members reflected after Sunday’s well-received set. The three changed schools in the process, with Thompson ending up at Carlton Comprehensive Public High School and Giroux and Bayda going to St. Mary High School. The three musicians are now Grade 11 students at their respective schools. Usually, a change in schools means a change in friends, but the three stayed together, bound together by their shared interest in music and dedication to finding a sound. “We started out as best friends and we’re lucky to still be best friends,” Thompson said. A search of “Forgive and Forget” runs countless results, they liked the idea of The Wolf, so they switched names, adding an “E” to the end to make it more unique. Young Prince Albert women weren’t in school Friday night and Saturday, but they still learned many important lessons. The P.A. YWCA held their fifth annual “The Power of Being a Girl” leadership conference at the PA Exhibition Grounds in the Grand Stand Building. Grades 9-12 learned on Friday, while Grades 5-8 were educated on Saturday. They attended workshops focusing on self-esteem, healthy relationships and discrimination, while also learning about car care and how to properly maintain a budget. 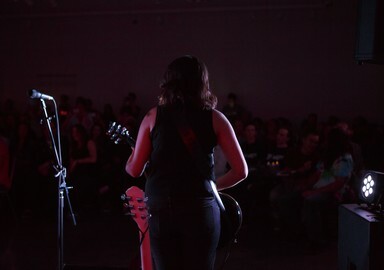 One of the most popular workshops saw girls singing along with local all-girl high-school band The Wolfe, and hearing about how great it is to follow your passion. The Wolfe would play their em’power’ment ballads and share their personal story for a half-hour, and then as part of the workshop the girls would learn the chorus of a song written specifically for the conference. At the end anyone brave enough could step on stage and sing or play an instrument. The Wolfe put out their first single “The Sea and Me” late last year. It can be found here. Angie Robertson ran the car workshops, teaching young girls road safety tips, how to change a tire, and check their oil. Robertson calls these skills invaluable for anyone, especially in Saskatchewan during winter, but it was especially critical for girls to learn these skills. She said that in families with brothers and fathers, girls weren’t being taught how to take care of their car since there was a male around to do the work instead. The young women also learned about finance. Jolene Meinema, senior manager of personal banking with Scotiabank, made sure that the girls in her workshop were active and engaged while dealing with the more abstract concept. Older girls learned about budget planning, working with a scenario where they had to manage their money and learn the difference between a want and a need. The younger girls played financial trivia, having to guess how much items cost and learning how much more money men make versus women. She also taught them about alternative ways to be successful instead of travelling the traditional route of going to university. Meinema herself, who grew up in a single parent household, didn’t attend post-secondary out of high school. The leadership conference might soon not be exclusive to girls. Brooks and her team has looked at a YWCA program in Moncton called “The Strength in Being a Boy.” It counters the stereotypical image of masculinity. They may only be in Grade 10, but The Wolfe are ready to take the world by storm. When they were in Grade 7, the four girls didn’t realize what would happen when they started to toy with the idea of starting a band. The two girls then thought of asking Bayda, who they said was a good singer, to join them as well as their other friend Neufeld. Since they wanted to start the band but couldn’t play any instruments, Thompson’s mother suggested they look into Jam Street Music. There, Lucy James taught them how to play and be a band. “She runs Jam Street, she helps us find all of our gigs and then she runs through all the chords and stuff with us and makes sure we have the song down pat,” Neufeld said. “It is like an extra ear to tell us if we are actually doing good,” added Thompson. They found working with James at Jam Street a very positive experience. “I think it was also a really helpful step when we were starting out because it is really easy to get discouraged because we didn’t know anything,” Bayda said. “None of us knew how to play our instruments. Not only do the girls have their own band, they are now role models for younger children in Prince Albert. Giroux said they do a lot of workshops with at-risk youth in the area. “It is really interesting seeing how us, just starting out, how we are affecting them already,” she said. 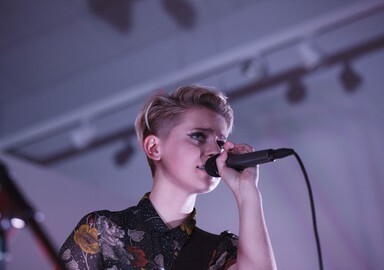 Through the YWCA, the band played at a school to help out children, Bayda said. They all agreed being in The Wolfe has given them more confidence and made them more social. Their first original song is about peer pressure and someone being forced into something by their friends. Giroux said they all work on writing songs together. In the future, the girls hope to continue to inspire people and make more original music. Music also helps them express their feelings and emotions. They are already starting to get more recognition and gigs in the community. “Last year we almost doubled from our first year and we got to play lots of new shows,” Giroux said. “We were the first band to play at Bedrock Festival in Struthers Lake. There was a last minute thing and it was cool being the first band ever to play." 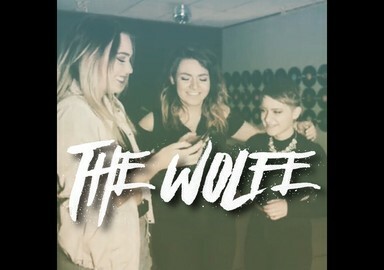 After only a few weeks since their original single-song release, The Wolfe has already received lots of positive feedback from their listeners. 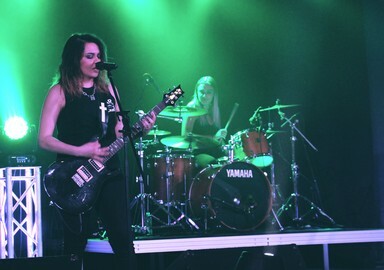 The Wolfe is an all-female alternative-rock band based in Prince Albert. This group of four was established in 2012 under their original name of Forgive and Forget. The band members attended the Rivier Academy together, which is where The Wolfe band really came to fruition. “I was with the beginning of the band," said Wolfe vocalist and bass player Siobhan Bayda. "It was originally just the four of us and we decided that one day we wanted to make a band." Bayda said they play a mixture of alternative and indie music but they mostly enjoy playing alternative-rock. “We wrote The Sea and Me and it just kind of clicked,” she said. 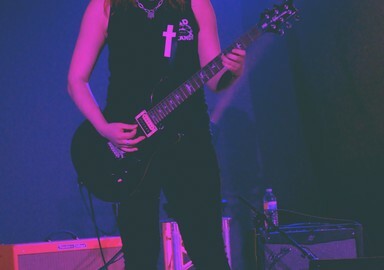 Gabrielle Giroux plays guitar and does back-up vocals for the band. She said her passion for music is why she joined the group. “I’d always really loved music and it was always something I knew I wanted to be part of but I never really knew how, “said Giroux. Being their first time releasing a single Giroux said it was a real learning experience. Along with their originals The Wolfe plays songs from The Black Keys, Panic! At The Disco and Imagine Dragons. Bayda was excited to say the band won’t stop with the release of their single, they want to continue to share their music with the public. “We have a couple songs on the go right now that were hoping to get out soon,” she said. Other band members include Tesa Thompson on the drums and Andy Neufeld on the keyboard. 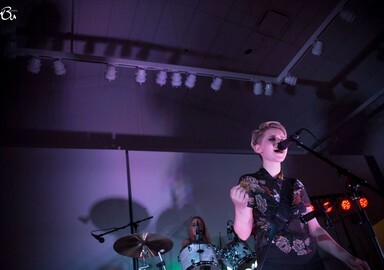 With the success of their debut self-titled EP, The Wolfe released their follow up record, Strange Words, in April of 2018. 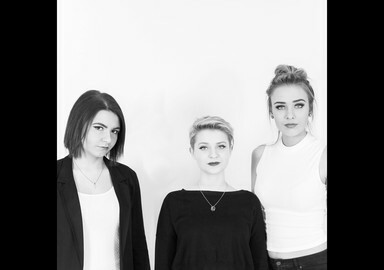 This all-female trio from Prince Albert, Saskatchewan, having already gained national recognition in 2017 as one of the Top 4 Finalists in CBC Searchlight, has solidified their place in the music scene with both singles off of Strange Words gaining radio play, charting, and reaching new international fans. With sassy to touching lyrics, mature vocals, intricate bass lines, rock beats, and the familiar delayed guitar hooks, Strange Words reaches both passionate rock fans, and avid pop listeners. Don't you see that she's afraid of the sea? Are you more afraid of death or dying? Do you smoke to flip a calendar? Sweetheart, can you hear the noise on the street?